A vaginal steam (often referred to as a V-Steam) is an effective and relaxing way to promote reproductive health. The V-Steams are ph balanced to help the body naturally cleanse the vaginal and uterine linings in a safe and gentle way. The warm steam and natural essential oils from the plants nourish and tonify the vaginal and uterine tissues. While improving circulation, the steams alleviate symptoms caused by, or related to, congestion in these tissues. In a medium covered pot, pour 8 cups of water (preferably purified water). Bring water to a soft boil for 5 minutes. Turn of the heat, leave the lid on and steep for another 5 minutes with the lid on. Pour 4 cups (half) of water into the bowl you have placed in your toilet. Wave your hand 8-10 inches over the herbal water to make sure it is not too hot. Remove you underwear and sit on the seat above the steaming water. Drape a large blanket or sheet around your waist down to the floor making sure no steam escapes. Make sure you keep yourself warm, keeping something on your feet (socks, slippers) and neck. You do not want any cold to get into your body while you are trying to warm it. You should feel a warm, rolling heat for about 10-12 minutes. 11.When the steam dies down dump the water into the toilet. Starting with step #4 begin the second dosage. If it has cooled too much reheat but test again before sitting over the steam. * For advice on which herbs to use, consult an Arvigo Practitioner beforehand. Increases the effectiveness of assisted (IVF, IUI, Donor). Please Note: consult an Arvigo Practitioner before using steams during these cycles. It is very important to test the temperature of the steam before using. If it is too hot wait 15 seconds and test it again until it feels comfortably warm to steam with. Do not add or use “essential oils” they are too strong and may burn sensitive genital tissue. It can temporary increase menstrual flow with more dark fluids or debris. Menses may start earlier than usual due to the cleansing effect. Plants: Dry or fresh plants are suggested. Also, if possible, use organic plants. Many plants you find on your spice rack are perfect. Most commonly used are basil (move fluids), rosemary (anti-bacterial, anti-fungal, anti-microbial), oregano (antiseptic, antispasmodic, expectorant), calendula (anti- inflammatory), motherwort (tonifies, cramping, infections), mugwort (all purpose), marigolds (same properties as calendula). Avoid V-Steams if you are pregnant, after ovulation (if attempts have been made to conceive,) if you are bleeding heavily, during the full flow of period, you have an acute infection, and/or you have vaginal sores or blisters. 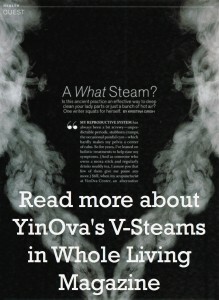 Here at the Yinova Center you can schedule a V-Steam with a trained and experienced therapist. However you can also steam at home, but consult an MD, herbalist, or certified abdominal massage practitioner when combining herbs (do not use essential oils, since quality is hard to regulate, few are pure, and they’re too concentrated and strong for internal use).